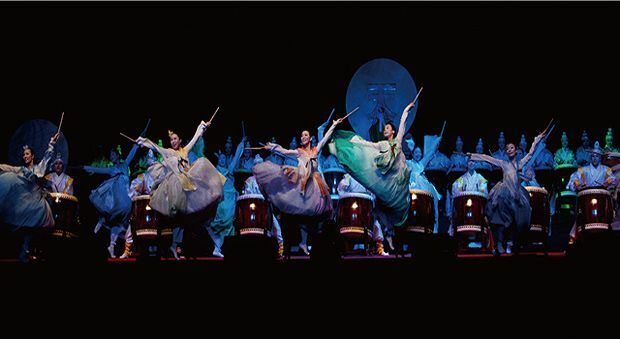 From the moment the masked dancers enter through the audience to the stunning, emotive finale, this show produced by the Korean Tourism Development Institute captivates and beguiles with its timely call for peace on earth. This production fuses ritual, traditional and modern dance and storytelling to incredible effect. A wonderful ensemble seem to glide on silken gowns, whirling with fans and flowers – almost like extensions of their bodies – as they move through moods melancholic, loving and defiant. The parasol routine, visually ravishing with red and gold costumes, is as precise a piece of choreography as audiences are likely to see at the festival this year, rendered in perfect symmetry. But it's through the powerful, floor-shaking drumming that the show really comes into its own. The female ensemble integrate flashing swords, bells attached to their feet and thunderous tribal drumming into the fiery choreography. Manoeuvring eleven large drums on wheels, with one massive drum played solo in the centre, they shift positions as they play, never once breaking their stride. You almost see colour and hear sound in an entirely new way. As the angel of peace enters, dressed like a dove all in white, it is hard to not feel profoundly moved by this truly beautiful experience.